Smartphones and tablets are great for all sorts of games, and lately we've been thinking about new ways to play. Chrome Super Sync Sports is a new Chrome Experiment that uses the unique features of mobile devices to create a new gaming experience on big and small screens. 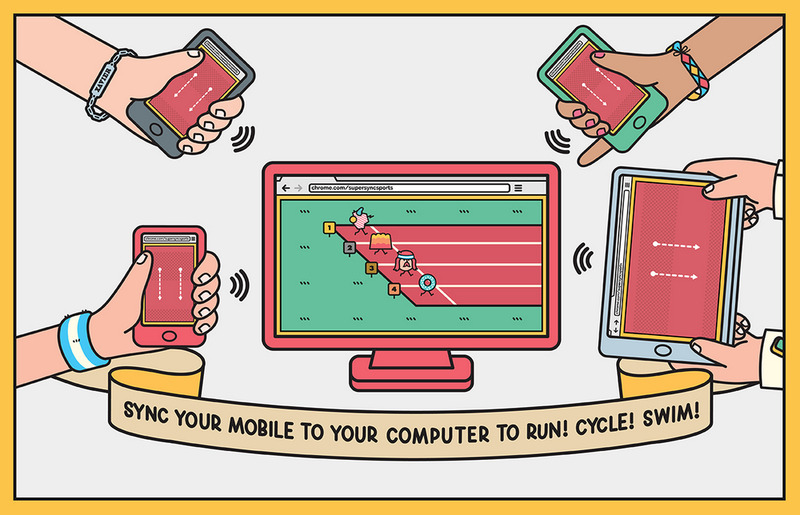 In this game up to four friends can compete in running, swimming and cycling on a shared computer screen, using their smartphones or tablets as game controllers. To get started, you’ll need a computer and a smartphone or tablet that run a modern browser, like Chrome. Visit chrome.com/supersyncsports on your computer, pick a game and decide if you’re playing solo or with friends. Next, visit g.co/super in Chrome on your smartphone or tablet and type in the unique code shown on your computer screen. You’ve now “super sync”ed your mobile device with your computer, and you’re ready to race! 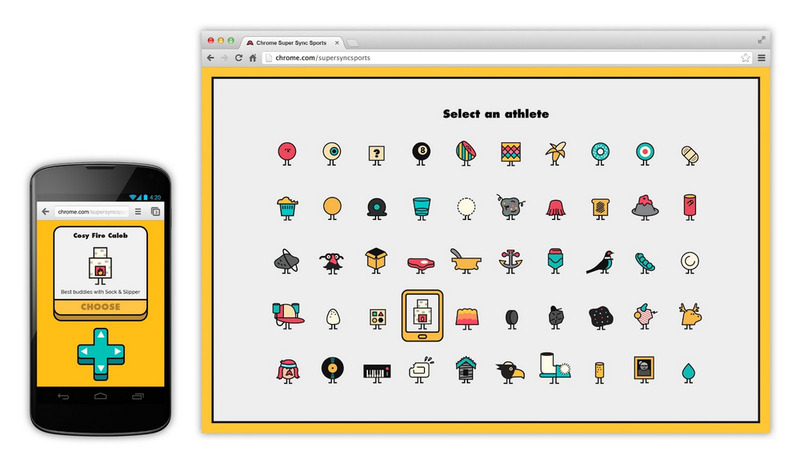 Use the arrow pad on your smartphone or tablet to select one of 50 athletes and prepare yourself for the competition. The motions you make on your mobile touchscreen will move your athlete on your computer screen. To move your athlete forward and win the race, you need to make the correct gestures as quickly as possible. The better you are, the higher your chances of making it to the global leaderboard. Chrome Super Sync Sports is available for Chrome v15 and above, and for Android 4.0+ and iOS 4.3+ devices. It uses the latest modern web technologies, including HTML5 features such as WebSockets for real-time gaming synchronicity on desktop and mobile, and Canvas and CSS3 for rich and engaging visuals. For more detailed information on the technologies used, see the “About” page. 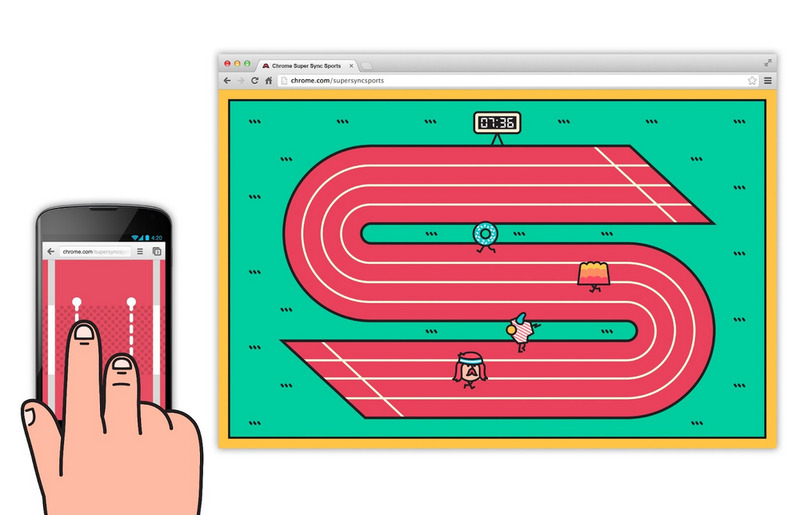 On your marks, get set, race for your place on the World Leaderboard!